Quanton is excited to announce DX Seminar: Robotic Process Automation. The inaugural event in Quanton's seminar series will give business leaders vital information to address the immediate opportunity of Robotic Process Automation and the emergence of Intelligent Automation. 53% of organisations are looking at a significant investment in or focus on RPA to support their operational goals in the next year. DX Seminar is an event series designed to give innovative business and technology leaders the knowledge they need to drive real benefit and hero conversations about Robotic Automation, Artificial Intelligence and other smart technologies in their organisations. Full details about the inaugural event taking place in Auckland on Thursday, September 28th (2018) including speakers and tickets is online now. Get knowledge from leading Australasian practitioners, and global and local technology leaders. Focused on providing practical knowledge from real-life experience the event will feature a range of Australasian presenters. 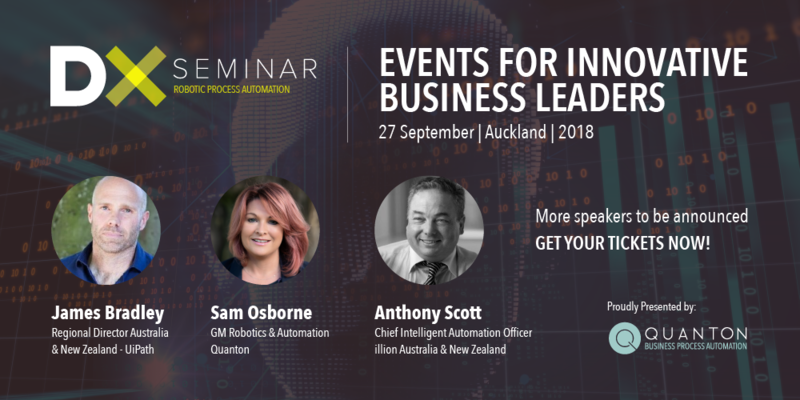 Speakers include RPA user Anthony Scott, Chief Intelligent Automation Officer, illion, global technology leader James Bradley, Australia and New Zealand Regional Director, UiPath and local technology leaders Mark Broome, New Zealand Country Manager, Abbyy and Sam Osborne, GM Robotics and Automation, Quanton. This exciting line-up is alongside other speakers still to be announced. 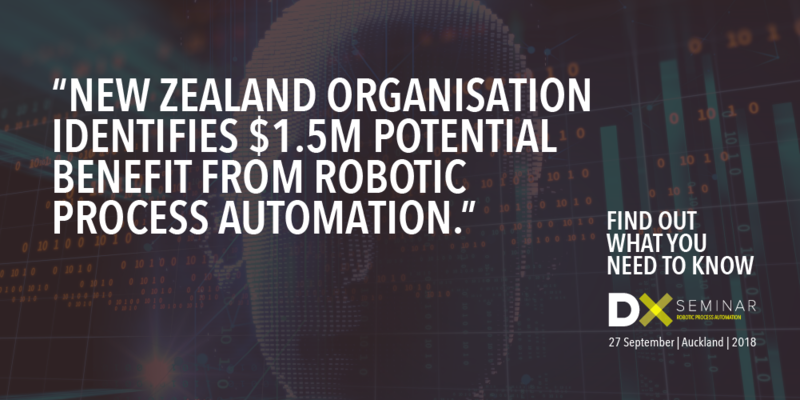 Since Quanton first introduced Robotic Process Automation to the New Zealand market in 2016, early adopting local organisations have begun realising immediate benefits and domestic demand has rapidly exploded. 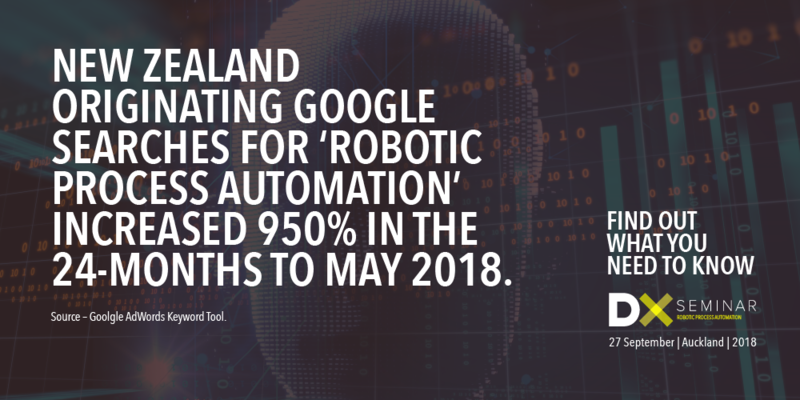 New Zealand originating Google searches for 'Robotic Process Automation' increased 90% and 950% respectively for the 12 and 24-month periods ended May 2018 and in a recent case study published by Quanton a New Zealand organisaiton reported an estimated 3,300 hours annual benefit from a single process automated in their pilot. Since then the same organisation has identified over $1.5 million in estimated future benefit from eight processes suitable for automation. These results are explored alongside successes from other New Zealand and global organisations in an article recently published by Sam Osborne. As the domestic market continues to grow and develop, Quanton's role is to aid businesses to understand and realise the opportunity for Robotic Automation and the future opportunities presented by Artificial Intelligence, Intelligent Automation and other smart technologies. This sentiment is described aptly by Sam Osborne, who directly supported the implementation of New Zealand's first RPA programme, when she said "it's particularly exciting to work with businesses across New Zealand who are embracing emerging technologies to drive transformative change." 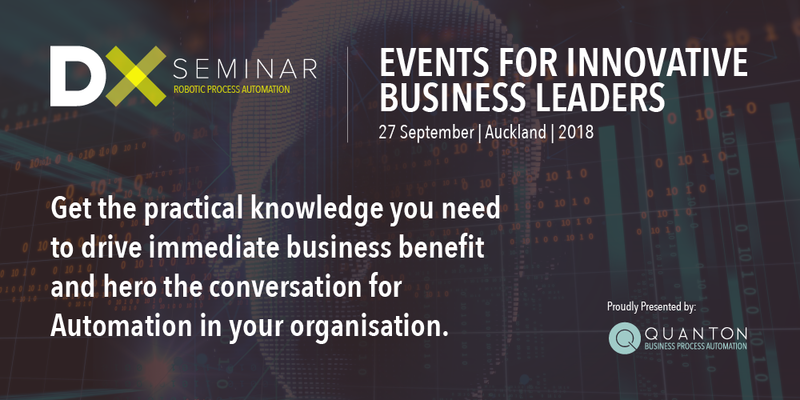 DX Seminar: Robotic Process Automation is a must-attend event for business and technology leaders involved in operational strategy, process automation, process improvement shared services or business transformation. The half-day seminar is expected to be attended by innovative leaders from a variety of sectors ranging from financial services to telecommunications, local government, infrastructure, and health to food production and more. Distinguishing between the hype, the promise and the reality, DX Seminars will give innovative leaders the practical knowledge they need to drive immediate business value and prepare their organisations for advanced technologies such as Artificial Intelligence, Machine Learning, Natural Language Processing (NLG), Optical Character Recognition (OCR) and other smart technology. Gain a global and local context of what is possible now with Robotic Automation and the emerging opportunities of Intelligent Automation. Review successful approaches and get critical lessons from RPA practitioners and leaders. Gain insights from local technology leaders supporting New Zealand implementations.